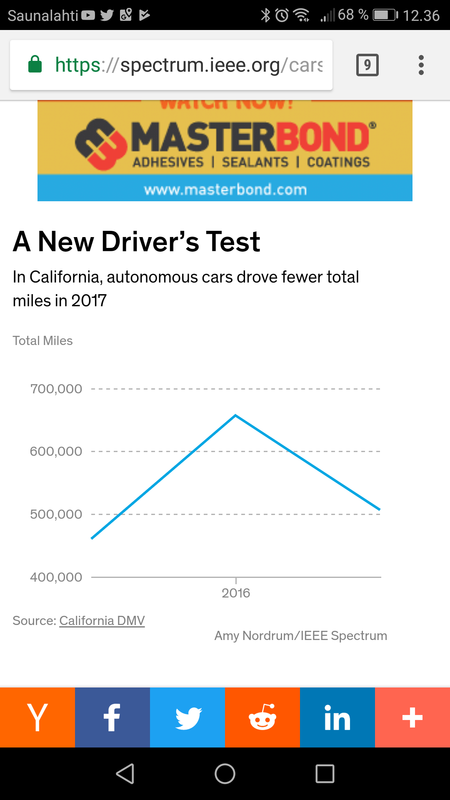 Every January, the California Department of Motor Vehicles (DMV) releases data from companies that operated highly automated vehicles on the state’s public roads the previous year. Companies get to decide how to record these so-called disengagements. Variety in reporting makes for widely disparate data. The disengagement reports are thus probably best viewed as marketing documents. Despite more companies in the mix, the shine appears to be wearing off from the Golden State for autonomous vehicle testing, with total reported mileage down by more than 20 percent from 2016.
i dont agree to this. Auto driven cars may be a great technology but it is not reliable. The car android system can go wrong and it can create a lot problems for the owner. So it is best to get a car which you can drive only. No automated driving.